"what it's like being a 'zipper-club' Auntie"
A few weeks ago, I stated that due to recent events I wasn’t able to plan much for Congenital Heart Defect (CHD) Awareness this year. Well the morning after that particular blogpost went live, my sister Danika sent a text to ask if she could run a few idea by me, as she wanted to raise a little awareness herself and told me to call her as soon as possible. When I finally got a chance to call her back, she asked if she could write a post about how CHD has personally affected her, and give some perspective as a family member. I immediately loved the idea and told her to get it to me as fast as possible, as I thought that would be something awesome to post and share here. I have thought many times on where to begin, but for me it started over 3 years ago when I got the call that has changed and shaped the course of our lives over the last few years. It was a regular (but very cold) November morning, and had gone to the city to get some shopping done before my sister's gender reveal party – and anyone who knows my sister, knows that she loves to plan a good party & event. Kierra loves the aspect of the fun and getting togetherness, but she also loves to plan and organize because she was – and still is, a very put together and organized person. Kierra had a Facebook event up for that evening’s gender reveal party, and I gotten a notification that the party was canceled. I instantly knew something was wrong and tried calling her, but she didn't answer right away, so I just waited for her to call me back instead. A little while later my phone rang. I quickly answered and immediately asked her why the party was canceled (I'm now tearing up as I write this). She proceeded to tell me that she had gone for her 18 week ultrasound and at first things seemed normal not realizing that having a doctor talk to you privately afterwards was not. She then told me about the heart defect. I felt the air leave my lungs. We sat on that phone together – not much more was said, and we just cried. How could this happen? Why? Was it even real? It's not fair. My heart just ached for my sister, and wanted to take everything off her shoulders and place them on mine. We ended the phone call, but I continued to cry all the way home. The next few months were emotional…. there were some high highs and some really low lows. I planned her baby shower and invited friends around us to celebrate. It was a bit different as we asked people not to gift Kierra with smaller sized baby clothes – as we were unsure if Evanna was going to have surgery right away – but it was a happy occasion nonetheless. Then Kierra had to leave and temporarily relocate to Edmonton to deliver Evanna, which so hard being far away, not knowing what the future was going to hold. Well the day of Evanna’s birth had arrived, and it wasn't anything like we had expected. She born via emergency cesarean, and I was kept waiting by the phone waiting for updates, but due to so much chaos... was somewhat left in the dark for most of the day. I kept praying that everything was ok. I remember finally getting that phone call – but was left in tears upon hearing the news. I was filled in and told that Evanna was unfortunately the “worst scenario” of the two diagnoses they were contemplating while Kierra was pregnant. So many thoughts raced through my mind as I thought of all the things my sister was never going to have with her daughter. I thought of how she was going to lose Evanna before she even had a chance to really know her. My heart ached, as I wished to trade places for just a few moments. It wasn't fair! I wanted to scream why? How? I then began to fall into a dangerous thinking pattern. I started to feel guilty that I had a healthy and happy child. I then had my second child and experienced some major post-partum anxiety. I wasn't sleeping nor functioning well. I eventually sought out counselling to deal with the guilt I felt. I kept telling myself and had many people tell me I shouldn't feel this way. But I did I couldn't help it! That was my sister! That was my niece! I wanted to fix something that I had no control of. It took a whole year to come to peace with our current family’s circumstances. Hospital visits (our version of “playdates”) became our new normal whenever Evanna was transferred closer to home, and alongside my sister, counted as each day, week and month passed us by…for a jaw-dropping 400 days in hospital. 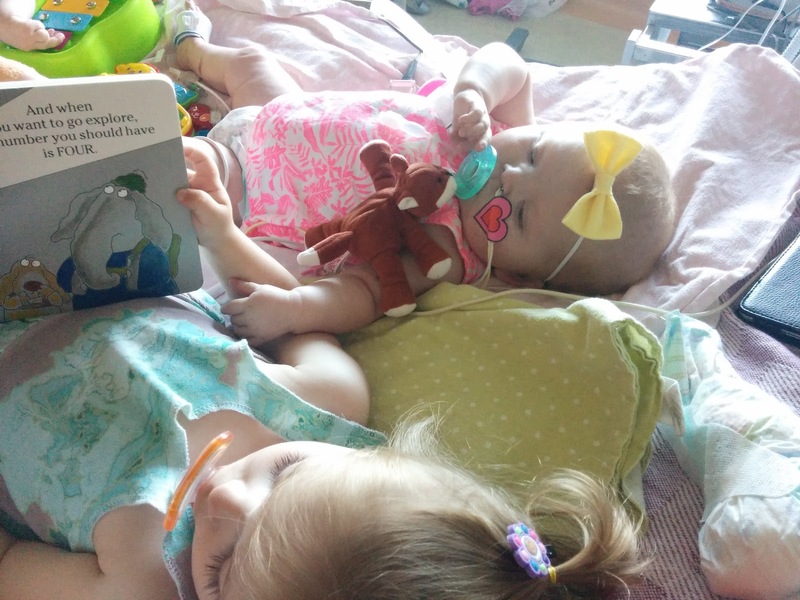 I got to experience some beautiful and very heartwarming moments throughout this journey too – my daughter Alexa always looked forward and loved our visits to the hospital with her cousin, and it was the cutest thing when she would give Evanna her a soother or read a book to her in the ICU crib. She wasn't afraid to climb right in and cuddle in close with Evanna. She didn't see cords and IV's – she just saw her little cousin who she looked forward to seeing every week. I will forever treasure those memories. 1. You don't realize the strength you have until you have to deal with something difficult. 3. It’s ok to cry. 5. My medical knowledge of things has definitely expanded – though I can't even begin to even touch the amount my sister and my brother-in-law knows. 6. I didn't realize that our family dynamic wasn't normal. A lot of people don't have the support my sister does from us and I will never let anything be so hard that I will turn my back..
7. I have learned to be thankful for the small things. 8. I learned how common Congenital Heart Defects are, and have now gotten involved in a lot more charity work and awareness campaigns. If January is going to be any indicator of how the rest of the year will go… then I might just retreat to my bedroom and hide under the covers til’ Christmas. It’s been one appointment after the next, working, continued construction of our basement, and just life in general. The last few months have definitely made me see why lots of moms of medically complex children give up their careers to stay home (or move to something that’s more home based), as I swear each day I’m adding another appointment that we have little say in. Clinics call and basically name the date and time, and unless it conflicts with another medical appointment – I just have to take it with a smile…cause these are specialists we’re talking about… and you take what you can get! It’s made me appreciate the careers Nick and I choose, and the ability we have to work around each other’s schedules so one of us is generally available to take Evanna to these appointments (along with the additional resources + funding we are given to ensure we have a 2nd person with us to help facilitate the transfer). It’s downright exhausting some days. I know it has more to do with the fact that most of this is currently “postop” related… so while February, March and April are expected to be just busy, I really hope just like last year, that things will somewhat calm down for the summer (pretty please?). We started the year/month off by hosting a causal brunch at our house on New Year’s Day with some of our closest friends (which already feels like a life time ago). It was something I had wanted to do for a while, but was unsure if it would happen given the whole Endocarditis situation and hospital admission. Thankfully Evanna flew through recovery, and we got home just before Christmas, meaning I was able to salvage our New Year’s brunch plans after all. The following week we had our Complex Airway Clinic appointment -- our first one for 2017 (at the moment we still see them on a monthly basis). While the Respirology team stayed up-to-date through emails over the past few months and were kept informed on her respiratory status while we were admitted, they were happy to see her back in clinic -- and looking so great I might add. The physician we saw happened to be the one who did Evanna’s bronchoscopy last May, and while he tends to be a “man of few words”, was thrilled to see Evanna. 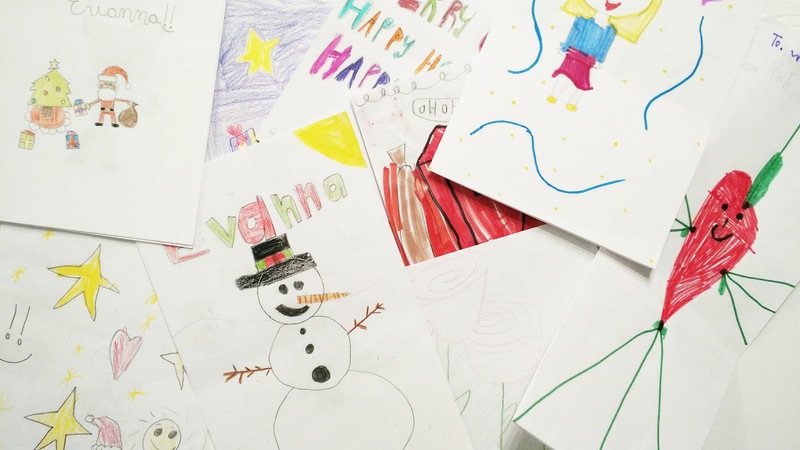 He noted how pleased he was to find out that despite dealing with something like Endocarditis, that she remained very stable – and even got to go home for a little bit in-between while we waited for her surgery (until we lost her PICC line that is….). Then to be discharged after just 11 days from surgery was just remarkable and just another indicator of how strong she truly is getting. While in clinic, they monitored her CO2 levels, and it stayed within a range of 28-33 (she use to sit in the 50s). Nick later told me that they average person sits between 35-45 and so this is one of the very first signs of being “over-ventilated”, and it’s time to proceed with another bronchoscopy to finally see if Evanna is ready to handle vent decreases (which the Respirologist agreed with). So once they consult with our ENT to see when he’s in the OR (they don’t necessarily need him for the procedure, but would like him in the “area” to pop in and quickly see Evanna’s trachea while they’re scoping her), and will book a date as soon as possible. From my understanding, we are currently aiming for March 1st, with a backup plan/date of April 5th – cause as you all know, it somewhat takes a “bump or two” before we actually see a procedure happen around here. Oi vey. On January 19th, we saw a special developmental pediatrician that we were referred to by the genetics clinic back in September at the Child Developmental Centre. I was initially told to expect a 3-4 hour appointment…but thankfully we were only there for about an hour. We didn’t learn too much that we already didn’t know, and essentially confirmed that we are already accessing the appropriate supports we currently need for Evanna. The pediatrician explained that she see’s many families with developmental issues, but most of them don’t have quite the extensive medical background that Evanna does – so sometimes the appointment can be quite lengthy as it goes into how to access certain programs – however, because of “all the medical stuff”, we don’t really have to fight as hard for certain resources and it all kind of “just falls into our laps” (as parents we still have to inquire and request for referrals to be sent…but for the most part we are immediately approved given our medical situation…another trach silver lining perhaps?). There were a few things that I did take away from this appointment that were very important to recognize as we move forward with Evanna’s care and development. The first thing the pediatrician said is we’ll probably never know if Evanna’s delays are actually “22q” (her chromosomal syndrome) related -- something the pediatrician said she specializes in; and for the most part, we will consider all of her delays medical related (very prolonged intubation period, very chronically sick until about Spring 2016 and the extensive sedation medication Evanna was on over a 12 month period). Next (which is somewhat common sense…), is that children cannot develop when they’re sick. So though we’ve been home since November 2015, Evanna was still technically pretty sick those first few months (there are times I wonder how we ever survived that initial period we were home lol) and it’s why we really didn’t see much development until about April/May. However, if Evanna continues to remain “healthy” (or as I always say “Evanna healthy”), we should continue to see lots of momentum in her development. Thirdly is that the pediatrician noted that Nick and I seem to be very realistic when it comes to our expectations. I guess she often see’s parents who come to her very frustrated and with somewhat unrealistic goals – and so she was happy to hear that we understand our complicated situation, know things will take time and though we will continue to push Evanna, it will have to be at an acceptable pace. To quickly note – based off her assessment, minus communication, the pediatrician placed Evanna at about 12 months of age developmentally…which closely matches to our time home (minus those first few months) and what I was hoping to hear. On Facebook I see a lot of parents absolutely devastated with these types of assessments from developmental appointments, but I feel like Nick and I are pretty realistic and so we weren’t thrown for a loop or caught off guard with anything that was said to us. Lastly (and most importantly), was speech + language. While we think Evanna is making great gains in regards to physical therapy (she got fitted for a walker a few weeks ago!…but more on that later), the pediatrician feels the one place we might experience a lot of trouble will be her communication…and that’s due to three reasons: first is “22q kids” tend to take a little longer to develop this skill and it’s very well-known they tend to not talk until they’re a little older. She then went onto explain that there’s a certain “window” that these skills begin to occur, and due to circumstances outside of our control, we basically missed that window (…and here’s where I begin to wonder if maybe Nick and I should have proceeded with the trach a lot sooner than we did….oh well – hindsight is always 20/20). Finally (and the most obvious), is the mechanical obstruction that the trach presents. 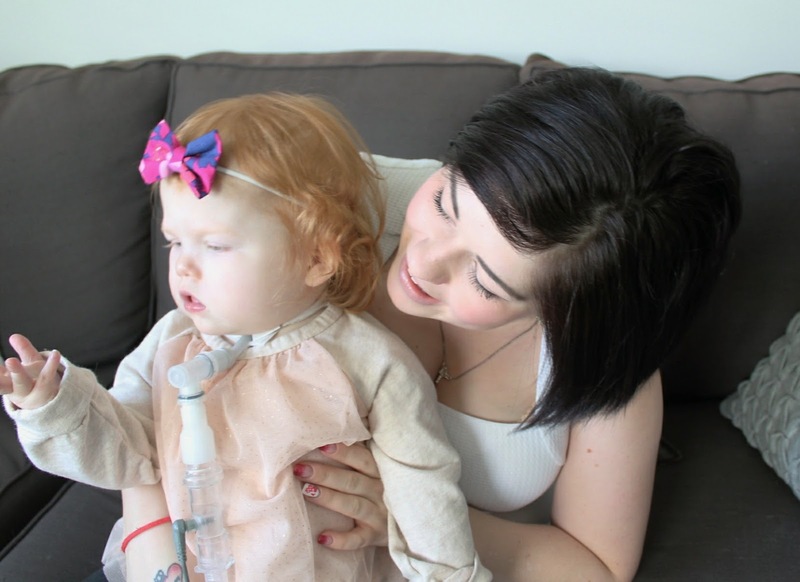 Due to all of this, she definitely would like to see other tools incorporated that will allow Evanna to communicate with us -- and the hope is that once a few of these obstacles are removed, it’ll allow for an easier transition. Sorry, I got more detailed then I had originally intended too, but it’s nice to take the time to properly explain things. Yes, we definitely have our work cut out for us and #Evannasroadtorecovery will be years in the making, but it will all be worth it. 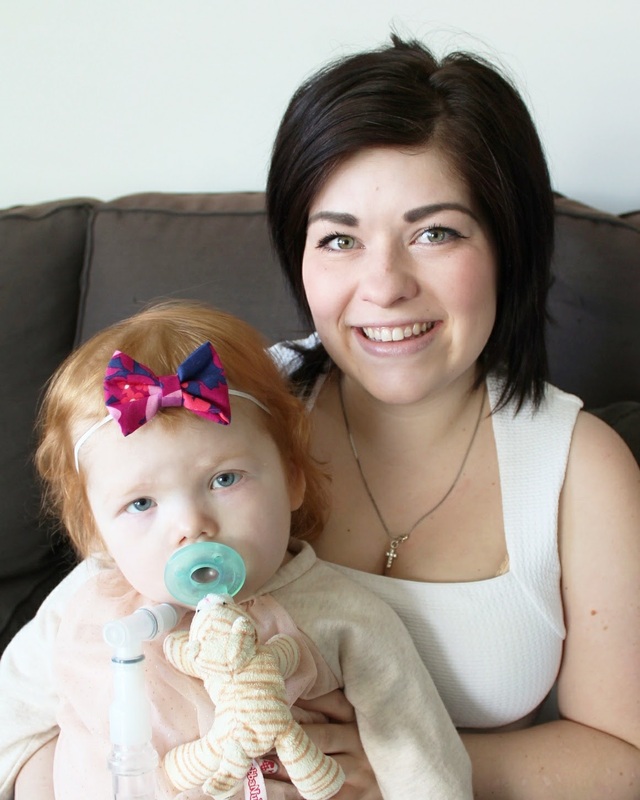 Last week was busy seeing our speech-language therapist where she showed us a few of the tools that the developmental pediatrician talked about and then getting Evanna fitted for a walker! Just like the standing frame and exersaucer, she absolutely hated it (girl hates change), but we know she’ll learn to love it in no time too. We’ve recently come to a place where the standing frame and exersaucer are no longer challenging for Evanna (she almost gets too excited when we pull them out to put her in), and so this has become the next natural step. We are now waiting on AADL funding to go through (though there is still a large portion that Nick and I still have to cough up…) – which takes about 4 weeks, to which it will then be delivered to our house to begin implementing into Evanna’s daily routine. We will still continue to use her standing frame and exersaucer as they provide great weight-bearing opportunities, but my hope is that over the next yr we will slowly transition from the standing frame to the walker exclusively. Baby steps! On Thursday [January 26] we saw our cardiologist for our official postop checkup and talk about Cath plans. The ECHO went very well and the tech was able to get a ton of amazing images! This particular ECHO tech is one we are extremely familiar with as he’s done probably about 80% of Evanna’s Calgary ECHO’s -- and we just love it because we’ve been able to build a nice relationship with him over the years. In fact, back in April when we were dealing with that major sternotomy infection – there was a lot of confusion surrounding a “sedated ECHO” to take place while Evanna was getting a CT done, but it was causing a lot of logistical issues and headaches at the time. Thankfully this ECHO tech knows Evanna very well and called up to the unit to explain that Evanna does NOT need to be sedated for an ECHO because she lies very still and normally is pretty easy to perform ECHOs on. He then came up to the unit with his equipment and immediately did the ECHO to prove his point – it was awesome! ANYWAYS, this ECHO went extremely well, and the tech got a LOT of amazing images of Evanna’s heart, and Megan (Nick’s sister who was helping me for the day) and I were laughing at the tech’s enthusiasm when he was hitting the “perfect spots” and getting some wonderful images of her new valve, her collaterals (which is rare to see from Ultrasound), and left ventricle. It was a fun exam to say the least. After the ECHO, we met with our Cardiologist to discuss how Evanna has been doing, and overall was happy to hear that things have been going better than ever. We decreased her Lasix (it’s a diuretic med) to just once a day and will probably take her completely off of it the next time we’re seen in clinic. We discussed what’s been going on from an infectious disease standpoint, as well as respiratory – and she was ecstatic to hear about the potential progress we’ll be making over the next several months. We then discussed plans for the Cath that we still need to do that was requested by Dr. Hanley (the Californian surgeon). We don’t need to “present” Evanna to cardiac conference in Edmonton again -- as that was already done back in the fall, but now that Evanna has been off antibiotics for several weeks, we just need to do ONE more blood draw to check that things remain “all clear” and our cardiologist will send the referral for the Cath…. which means we’re now aiming for a March date. I was slightly disappointed with this timeline, and overall hate just how much impact Oct/Nov/Dec’s Endocarditis episode has had over this California timeline (not to mention all the surgery bumps due to the terrible RSV season Alberta experience this past winter that created a huge bed shortage that we definitely felt the effects of). Regardless, we’re back on track and I really feel like patience is truly becoming a virtue of mine (and if you ask my parents – that’s quite an accomplishment lol). So, what’s been going on this week? WELL, I received a phone call last Friday from one of our Respirologists about a concern we’re having in regards to some ventilator alarms. 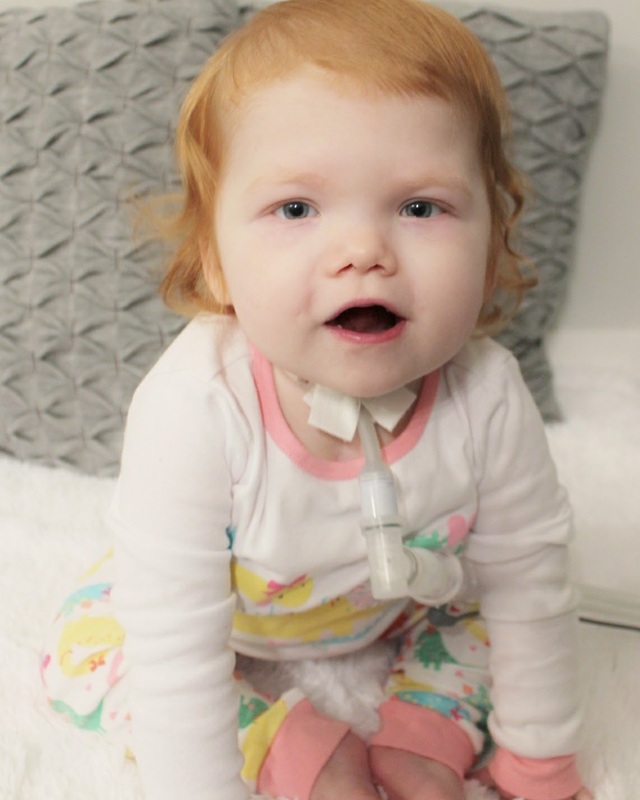 For about a month and since our last Complex Airway Clinic appointment that we had several weeks ago -- we’ve been dealing with an increase of alarms coming from Evanna’s ventilators. The one of most concern is the “apnea” alarm (she’s trying to breath below a set rate while sleeping…. 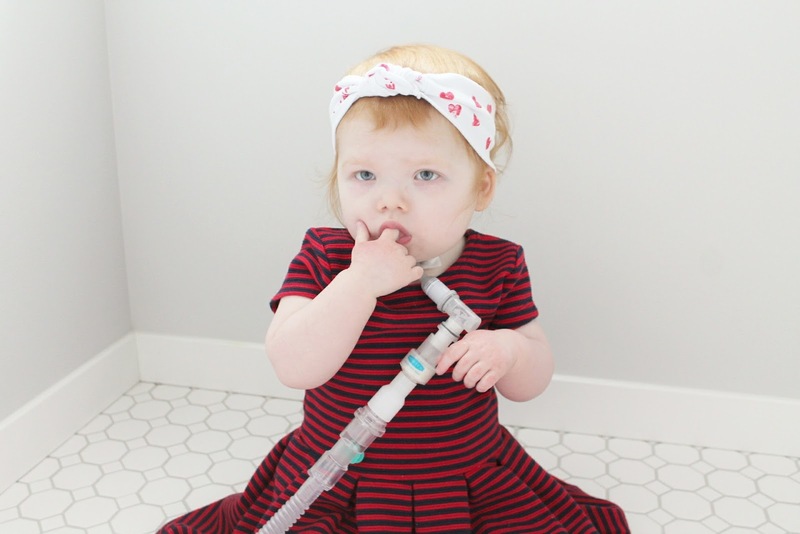 so I assure you it’s not a “true” apnea situation and she’s absolutely just fine), and so between that AND our CO2 results from our last appointment, we believe Evanna is being “over-ventilated” and growing out of her current settings – which is a very GOOD thing! They originally tried to get us into the PICU on Monday for some vent tweaking…but of course that didn’t happen…we tried again today….and now we’re trying for an admission TOMORROW (trust me, the Respirology team is not happy with ICU communication right now). I am so over this whole “gotta be bumped at least 2 times” before SH#% happens – especially when you consider the bronch and Cath coming up in the next few months that I just KNOW is going to have similar scenarios…. and so I’m currently having a “FML” moment right now lol. Lastly, Nick has been kept very busy with working on the basement suite (with help from his brother Ryan), and is literally is down there whenever he has a moment to spare. Evanna obviously complicates that, and unfortunately he can only get to it if I’m home to watch her or we have a nurse at the house. It’s still coming along quite nicely (painting is finally done, and kitchen cupboards are all in -- including the countertop and backsplash), but we’ll be so glad when this project get completed and we can finally focus on our own home (and boy do I have lots of ideas that I want to see happen lol….lucky Nick). I’m stuck trying to figure out a simple birthday theme for Evanna’s 3rd birthday (I’m open to ideas – so if you have any, feel free to pass them along! ), and overall doing my best to keep my head above water. Yesterday kicked off HEART MONTH, and while recent events have prevented me from planning anything major to aid in raising awareness, I was still able to get a few projects and collaborations put together –so stay tuned! Currently I have a little contest running with @MIGHTYWARRIORDESIGNS over on my Instagram account, and $2 from all sales of their Heart Collection is being donated to the Stollery Hospital Foundation. Cheers! PS. If you powered through and read through this entire post (and somewhat stayed focus without your head spinning from information overload), then B R A V O! Seriously! I know I throw a LOT out there, but I honestly do try my best to break things down for those who aren’t familiar with the medical world (and to be honest – it also helps me to write all our current happenings, as it helps me take all my jumbled up thoughts and arrange it neatly on this blog). If something is still confusing, please feel free to ask questions, as I don’t mind explaining things further!